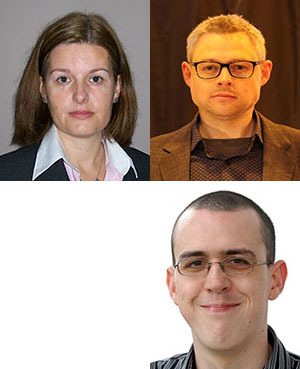 The School of Engineering is very pleased to announce that Drs Blanca Antizar-Ladislao, Luke Bisby, Stewart Smith and Andrea Hamilton have been appointed to the Royal Society of Edinburgh (RSE) Young Academy of Scotland (YAS). They will serve a three year term beginning in April 2013. The Young Academy brings together some of the most able and innovative young academics, entrepreneurs, artists and professionals in Scotland, with the aim of harnessing their creativity to develop a coherent and influential voice on behalf of the most talented people of their generation. The Academy members will be encouraged to work across disciplines to consider many of the most challenging issues facing society either domestically or globally, in fields as diverse as climate change, the economy, ethics or the arts. The YAS fosters interdisciplinary activities among emerging leaders from the disciplines of science and humanities, the professions, the arts, business and civil society. Established by the Royal Society of Edinburgh in 2011, the Young Academy of Scotland provides a platform for able and innovative young entrepreneurs, professionals and academics to develop a coherent and influential voice, and to address the most challenging issues facing society in Scotland and beyond. The YAS provides a means of reaching beyond the professional environments in which members work, thus contributing to policy and practice in all areas. It provides an opportunity for its members to interact across disciplines and professions with decision makers, opinion formers and experts, business leaders, funding bodies, national institutions, the public and the media within Scotland, the UK and internationally.